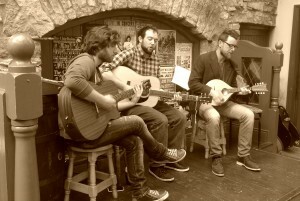 The McCabe brothers: a trio of vocals backed by a cool mix of guitar mandolin and Cajun. Playing anything from Beyoncé to the Beatles, to 70′s disco! These lads are home grown right here on Clare Island and have been making fingers click and kept feet tapping many a night here at the Sailor’s Bar.